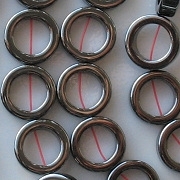 Rings with a 12mm diameter and thickness of 4mm. The beads appear to be in very good shape. 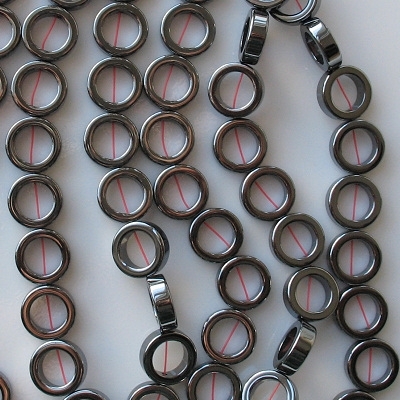 However, some beads have holes which are slightly off-center. 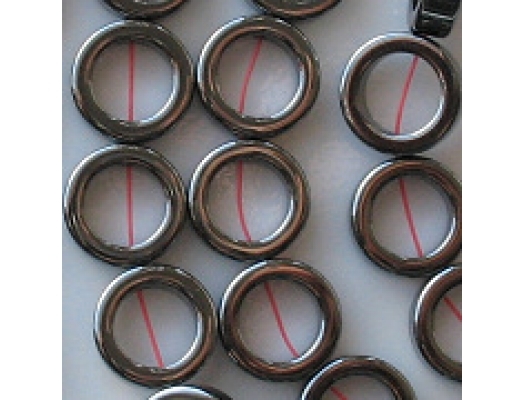 There is enough space inside each ring for an 7mm bead or an 8mm which is slightly under-sized. Hematite is iron oxide. Hematite is sometimes red, but this hematite is iron-colored. Actually, it looks like dark steel. If you want to see some of the rings from the side, look at the larger image. Please note that metal beads like this are heavier than glass. I originally posted these beads in lots of 20, then increased the lots to 25, then decreased the lots to 22, and now I'm back to lots of 20. Unfortunately, the price changes every time I purchase them.